Harvest Gold Memories: Have You Never Been Mellow? Beyond cached copies of millions of websites, the Internet Archive also has a multimedia section, although the extent of the content there is fairly limited, thanks in large part, to media conglomerates' desire to control where their content resides. However, they do have a collection of what it calls "Moving Images" (basically, Flash videos) and "Audio" which is mostly MP3s covering a wide array of content. One of my earliest discoveries on the Internet Archive's "media" collection (they have both audio and video, FYI) is a now-defunct radio show with the groovy '70s name "Have You Never Been Mellow". The DJ's Chuck Tomlinson and Joel Stitzel hosted this retro-radio program on Club 14 KLBB (1400 and 1470 AM) in Minneapolis. The program aired over a decade ago already, from April 1998 to May 1999. The show ran initially on Saturdays from 9-11 PM, then later on Sundays from 8-10 PM. You can catch all of the archives for this program from that gem of a program at: http://archive.org/details/hynbm-playlists. Still, the content on this program is something one might envision Marcia Brady, Laurie Partridge, or maybe one of the Bradford kids from "Eight Is Enough" listening to! The name of the program, perhaps aptly, is taken from Olivia Newton-John's 1975 hit "Have You Never Been Mellow". That followed another mellow tune: "Please, Mister, Please". Remember, this is long before Australia-mania of the 1980's (ushering in Australian artists like Rick Springfield and Men At Work) took off, and even before the movie "Grease" permanently engrained Olivia Newton-John as an American pop culture icon of the era. As for the music on this show, well, it's mellow, but like taking a step back in time. That seemed to be a trend during the 1970s. Even soft-drink giant Coca Cola introduced a soda they called Mello Yello (note the spelling) which they launched in 1979. Apparently, it's still offered, but you'd probably only find it in a retailer or convenience store that has a wide variety of sugary soft drinks. As I understand it, it was yet another citrus-flavored soft drink, not quite Sprite and far sweeter, it was supposed to be a rival to Pepsi's highly-caffeinated Mountain Dew, and yes, Mello Yello has a higher-than-normal amount of caffeine. "The smooth citrus taste of Mello Yello has refreshed people's thirst for over two decades. Its unique taste and confident, in-control style sets it apart from other soft drinks. 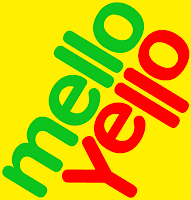 Mello Yello highlights the smooth choices in life – because when you drink Mello Yello, everything goes down easy." The brand even has a groovy, retro-themed website at: http://www.melloyello.com. Gee, that sounds really groovy, maybe even mellow. Not having tasted it, I cannot say whether it tastes anything like a sweet version of Fresca, but the website indicates they now offer a zero calorie version of the product called Mello Yello Zero (I guess now that the core market for the product is pretty old, these things matter), although it's limited in terms of availability, mostly to the Great Lakes states. Anyway, I can say the brand was part of an entire attitude during the seventies: mellow (which was often induced by marijuana, as head shops where people could buy rolling papers, bongs and various pipes used for recreational drug use popped up in small towns across America). Nowadays, that's no longer a teen subculture, but has gone kind of mainstream with "Medical Marijuana" distributors emerging in many states. Anyway, the "Have You Never Been Mellow" radio show is certainly worth listening to if you care to relive the mellow days of the seventies. For me, it kind of reminds me of going to the dentist's office. My dentist growing up was a pedriatric dentist, but his secret was nitrous oxide. In other words, he'd gas the kids up and get them higher than a kite, then do his work. He always played a mellow, adult rock station that played the kind of music featured in Chuck Tomlinson's and Joel Stitzel's "Have You Never Been Mellow". I can just hear Dionne Warwick singing "Deja Vu" now (which, incidentally, is on the playlist below) ... if only I had some nitrous oxide to go along with it! No, I've never really been into drugs, but the line seems to go with the direction the U.S. was taking back in the '70s and '80s – before Nancy Reagan's "Just Say No" campaign paved the way for modern-day First Ladies to spearhead such public service initiatives. Have a listen below for one of the "Have You Never Been Mellow" broadcasts below, or by visiting http://archive.org/details/hynbm-playlists. There, you'll find a bunch of shows that have been recorded as playlists. By the way, the broadcast included below is from July 11, 1998 (see http://archive.org/details/hynbm-1998-07-11 to access that archived broadcast directly). Just discovered your blog. Excellent stuff! I'm fascinated by Harvest Gold and Avocado Green myself! Drank my share of Mello Yello too.